Most of the business people keep a lot of “business cards” which they have on their own or exchanged each other before, and the number of those would be increased every year. Some of those have been no longer needed already, because some people on those have quit their company or have changed their section, even some cards were just given while drinking at Izakaya (Japanese bar). Sometimes we would like to throw them out, but we feel a bit bad about throwing them by ourselves because the cards have people’s name on it. 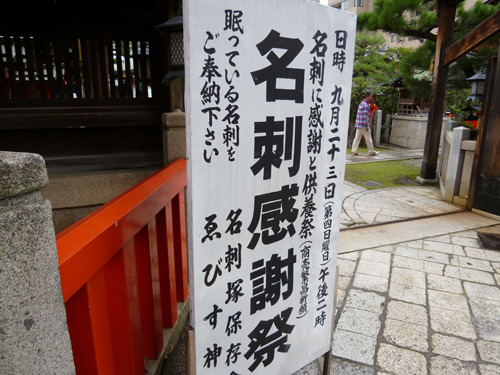 While hesitating, the writer of this article found a shrine in Kyoto, at which “a memorial service for business cards” is held. 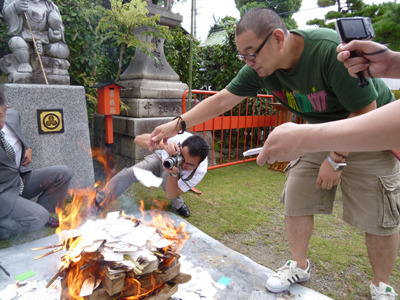 The writer decided to go to Kyoto to burn his unnecessary cards. First of all, he has to divide a number of cards piled-up for 14 years of his businessman’s life, into necessary ones and unnecessary ones. Will it stay here or go to Kyoto? They are going to Kyoto. 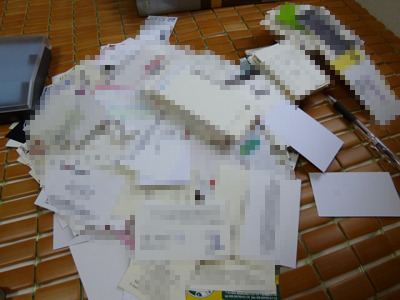 As a result of sorting, unnecessary business cards amounted to about 1,000. All of them are going to Kyoto. He has exchanged over 1,000 business cards for 14 years, which means he has met over 1,000 people for 14 years. It’s a kind of moving. But in fact, he has picked people who are really necessary for his life from those encounters, so the unnecessary cards he picked this time will not be needed for his life in his future. He took an expressway bus going toward Kyoto. 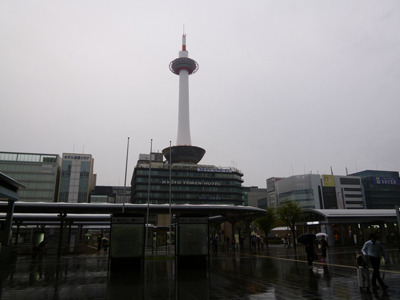 This is Kyoto Tower. There is a big bus terminal around here. 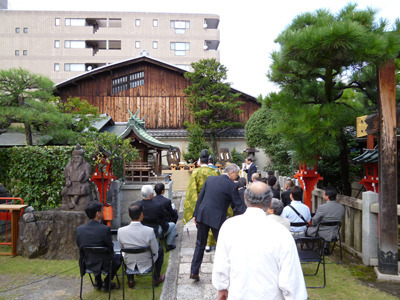 The destination this time is “Kyoto Ebisu Shrine“, at which “a memorial service for business cards” is held annually. 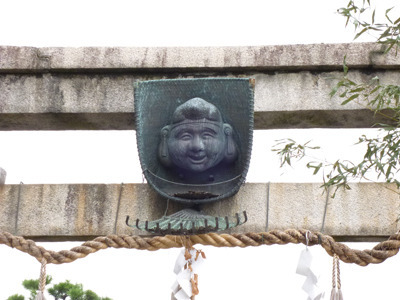 “Ebisu” is the Japanese God of fishermen, luck, and workingmen, as well as the guardian of the health of small children. 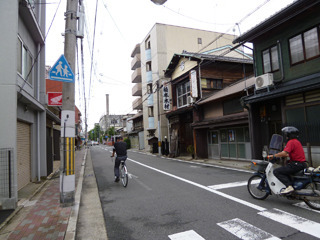 A typical view of the streets in Kyoto. 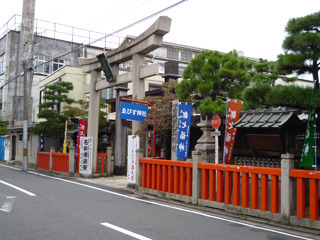 This is the entrance of Kyoto Ebisu Shrine. 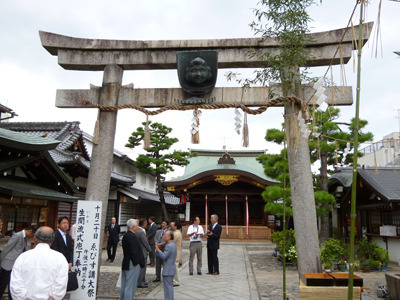 This is not a very big shrine, but it is known as Japanese God of businesspeople, “Ebisu san”. It says “A memorial service for business cards. 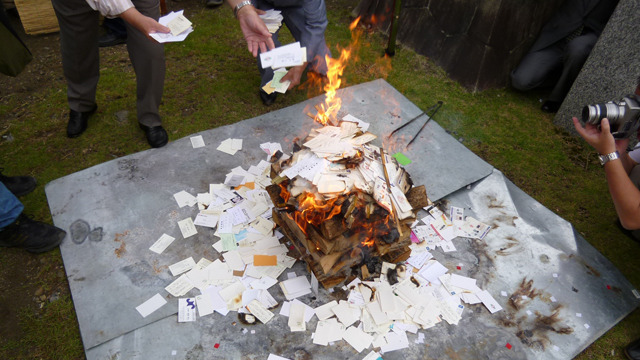 Once a year in autumn, people bring their own business cards that are no longer needed because of their promotion or unnecessary cards received from others before, and burn them together and thank god for their promotions. God is smiling at us. This is God “Ebisu san”. There were many business people wearing business suits. Probably they are going to burn the cards and thank god for their promotion. That looks a good atmosphere. People put their cards in this box together. He also put his 1,000 cards in the wooden box. People sitting on the chair and preparing for the ceremony. Finally it begins. 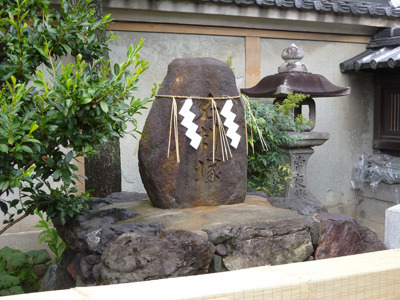 The ceremony will be held in front of this stone below. 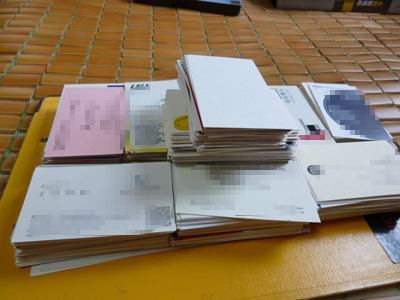 It’s called “Meishi-zuka”, a mound of business cards. 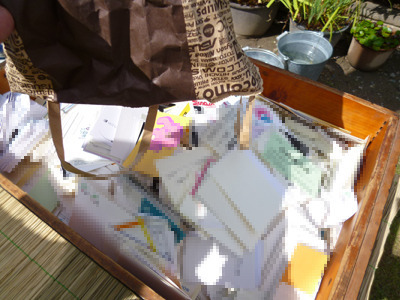 It says “Meishi-zuka”, a mound of business cards. The ceremony began at 14:00, the memorial service was started after some speech by some members. This ceremony has been held for 35 times, by the way. 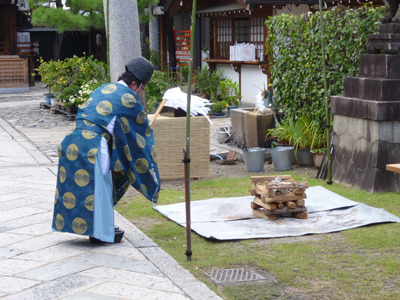 Shinto priests were bowing. 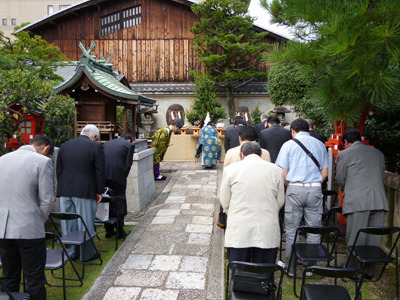 Prayers were offered to God by Shinto priests for a while. After that, everyone moved to the incineration site. Finally they burn the cards. That would be the best part. The priest set the box on fire. It was like a campfire, but it’s not. It’s a traditional ceremony. People were asked to join. The writer also joined. 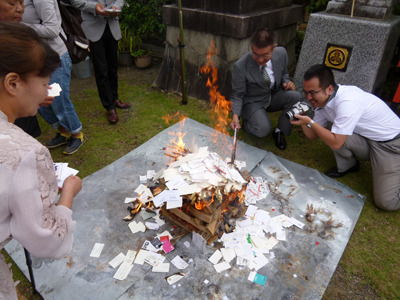 The participants were asked to help burning the cards, the writer also joined. Some people were taking pictures. It looks funny, doesn’t it? Please don’t forget! This is a highly respectable traditional ceremony. Because they are papers, they are easily burnable. 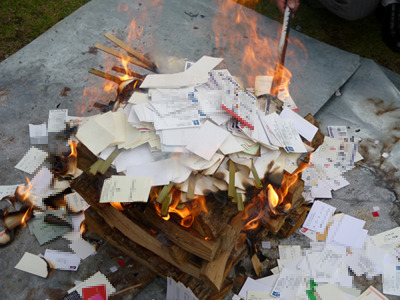 Burning all of them politely…. 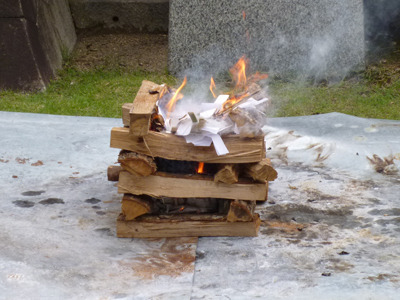 The priest politely burned the cards until all of them turned into ashes. Ebisu-san is smiling at them. 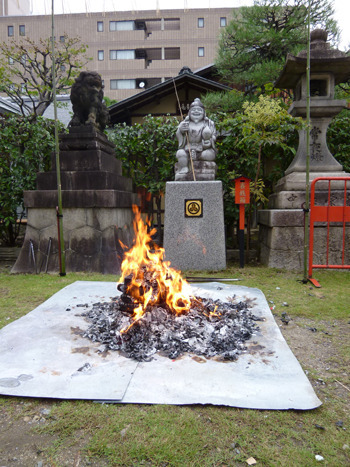 In front of Ebisu-san, all of the business cards turned into ashes. 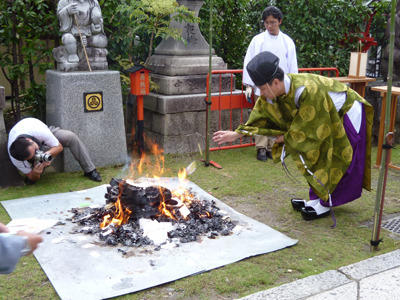 Looking at fires burning and God’s smiling, the writer felt this ceremony solemn, quiet and valuable. 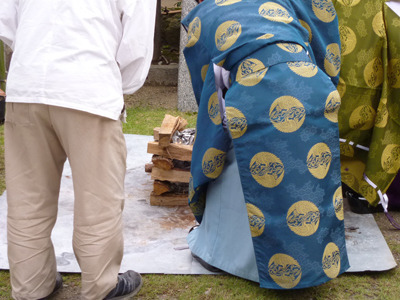 After taking about 1 hour, all the process of the ceremony was finished. 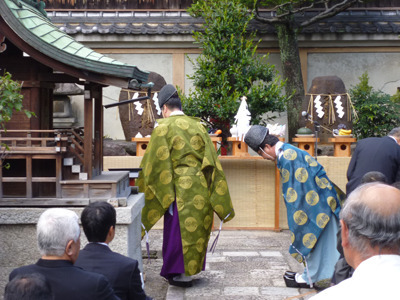 Everyone was smiling and felt happy with this ceremony, and had some tea served by the staff. The writer also got some tea for a while with a clear mind, and headed toward home. Now we have seen his report for the ceremony. What do you think? 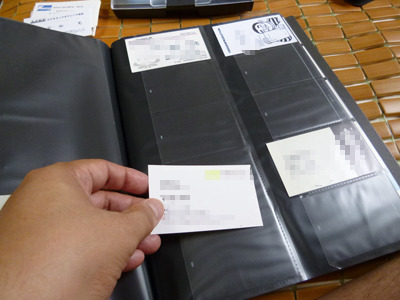 Probably I also feel a bit bad for just throwing out the business cards to the garbage box, like throwing out photos. So I think people would be happy if there are some events like this, held at many places throughout Japan. It would also be a good thing for personal information matters, I think.